According to the American Society of Plastic Surgeons, around 15.9 million surgical and minimally invasive cosmetic procedures were performed in 2015 where breast augmentation is the most common surgical cosmetic procedure with 290,467 surgeries in 2016 while according to American Academy of Implant Dentistry, over 30 million American citizens are missing all their teeth in one or both jaws that leads to nearly 15 million residents in the U.S. to undergo bridge and crown replacements. The cosmetic implants market is expected to reach USD 10.12 billion by 2025, growing at a CAGR of 7.10% during the forecast period. Facelift, reconstructive plastic surgery and eyelid reshaping were the top performing segments. Initiatives like Breast Reconstructive Awareness Campaign towards engaging, educating and empowering the people and technological innovations like 3D printed facial implants, microchip implants, hyaluronic acid facial filler and two form-stable silicone gel breast implants are expected to positively reinforce the market. However, high cost of treatment, low reimbursement policies, insurance coverage discrepancies and risk of malfunctions are expected to impact the target market negatively. Dental implants are one of the major segments and tend to witness higher demand within the global cosmetic implants market, on the account of production of novel products such as mini dental implants, tapered implants, and narrow-diameter implants. Breast implants is also expected to be the fastest growing segment during the forecast period from 2017 to 2025 and accounted for USD 0.96 billion in 2017 owing to extensive number of breast implant surgeries and introduction of implant devices like Sientra Silicone Breast Implant, Mentor MemoryGel and Allergen 410 Natrelle Silicone Breast Implants. The facial implants segment is expected to grow along with increase in number of road accidents, trauma cases, motivation among the youngsters to enhance their aesthetic looks and congenital face deformities. The calf implants market is expected to reach USD 0.1 billion by 2025 owing to achieve fit look by athletes and bodybuilders. Polymer implants were identified as the largest source of cosmetic implants in 2017 with the market share of 42.5% on the back of application in breast and facial implant procedures, coupled with high durability and the ability of polymers to be molded into various shapes. While metal implants are expected to witness the highest growth rate, growing at a CAGR of 6.43% during the forecast period due to enhancement in cosmetic dentistry practices. On the other hand, biological cosmetic implants are expected to grow at a lucrative rate over the forecast period owing to its biocompatibility and undisturbed healing phase. On the basis of region, South Korea has the market potential for being world plastic surgery market owing to population’s developing interest of retaining youth and beauty. South Korean cosmetic implants market is expected to attain the valuation of USD 0.32 billion by 2025, growing at a CAGR of 9.45% over the forecast period. However, North America dominated the market with market share of 30% in 2017 owing to changing lifestyle, presence of sophisticated healthcare infrastructure, high economic development, larger disposable incomes and emphasis on aesthetic appeal. Asia Pacific presents lucrative growth opportunities for players in the cosmetic implants market owing to rising awareness levels pertaining to physical and aesthetic appearances among the population and improving healthcare infrastructure. Singapore, India, Malaysia, Indonesia and South Korea are the opportunistic market owing to medical tourism and increased focus on the development of technologically advanced and cost-effective products. The report covers the present ground scenario and the future growth prospects of the facility management market for 2017-2025 along with the market players’ analysis. We calculated the market size and revenue share on the basis of revenue generated from major players worldwide. Cosmetic Implants market is forecasted on the basis of revenue analysis, product benchmarking and strategic developments of key market players. Global Cosmetic Implants Market Outlook 2017-2025, has been prepared based on an in-depth market analysis from industry experts. The report covers the competitive landscape and current position of major players in the Cosmetic Implants market space. The report also includes porter’s five force model, SWOT analysis, company profiling, business strategies of market players and their business models. “Global Cosmetic Implants Market Report” also recognizes value chain analysis to understand the cost differentiation, pricing models to provide competitive advantage to the existing and new entry players. 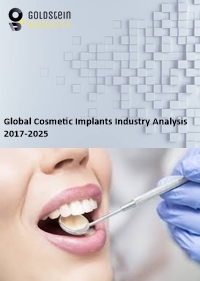 Our Global Cosmetic Implants Market Report comprises of the following companies as the key players: Nobel BioCare, DENTSPLY International, Straumann AG, Biomet, Inc., Zimmer Holdings, Inc., 3M Health Care, Spectrum Medical Designs, Implantech Inc., GC Aesthetics, Mentor Worldwide LLC, Allergan, Inc., Aesthetic and Reconstructive Technologies (AART) Inc. and Sientra, Inc.